00:25:00 Makes 4 servings, one sandwich (233 g) each. Makes 4 servings, one sandwich (233 g) each. These saucy chicken sandwiches are ready in no time. You have to try them to believe them! Cook chicken and onions in skillet on medium-high heat 8 min., stirring occasionally. Add barbecue sauce, water and sugar; stir. Reduce heat to medium; cover. Cook an additional 7 min. or until chicken is cooked through (170ºF). Remove chicken from skillet. Shred chicken with 2 forks or chop into small pieces. Return to skillet; stir until evenly coated with sauce. 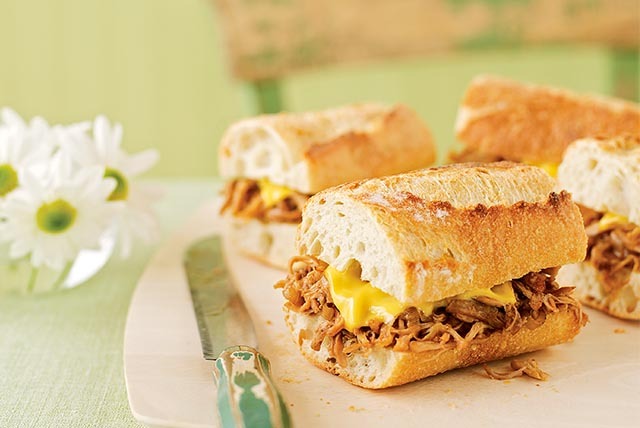 Cut baguette lengthwise in half; spread top half evenly with Cheez Whiz. Cut crosswise into four pieces. Fill with chicken mixture. Prepare as directed, using your favourite flavour of Kraft BBQ Sauce. Serving Size Makes 4 servings, one sandwich (233 g) each.